One of the great joys of RVing involves sitting back with your newfound buddies, stretching your favourite stories with a chilled brew in hand against the waft of snags to the tune of tried and tested songs. For the uninitiated, the ritual is “happy hour”: the quest for its perfection, eternal. But where do you start? CW is here to help. The first two things you need to know about happy hour is that it always happens outside and is never a one-hour event; you need to prepare for all elements. Protecting yourself from the Australian sun goes without saying – sunscreen, long sleeve shirts and hats all help, but a much easier and more inviting way to stay sun smart is to bring along your own shade. 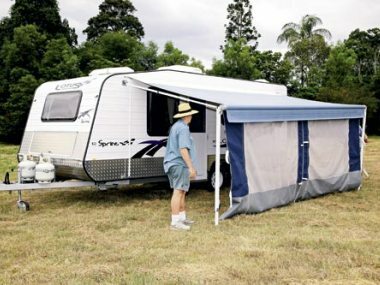 Awnings are increasingly “standard inclusions” with new caravans and are UV-rated. Typically, PVC awnings provide the greatest protection. Sun-shade annex walls attach to awnings easily, especially the spring-loaded type. Many Australian companies make sun-shade annex walls to size (also known as privacy screens) including Australiawide Annexes and Tebbs Canvas Products. Your travels will probably take you to wild and woolly places. A good general rule of thumb is that the further north you go the bigger everything gets: foliage, petrol prices and insects – which can get as big as a new born, according to reputable local sources. Your first line of defence is a flyswat. Mainly because not having one will, frankly, have you kicked off the happy hour circuit. For real defence though, quality repellent such as Bushman DryGel (which also has a sunscreen), Aeroguard Tropical Strength and the Mosquito-Band and are three proven performers. When you consider the growing sizes of RV fridges you may ask yourself, how could I possibly need another? But, trust me, as you reach for your umpteenth beverage, trudging in and out of your RV becomes a downright drag. Those seriously committed to whittling away the hours should consider a second portable fridge. 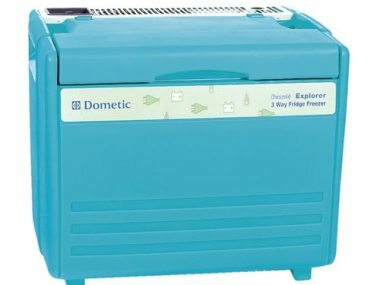 If you have a second gas cylinder on board, a three-way upright variety is a great solution – we like the Dometic 50L (rrp $1249), be warned though, when running on 12V, three-way fridges consume a lot more power (many times over, in fact) than an equivelant sized two-way alternative. If connecting a fridge up to a power supply seems too much like hard work (the antipathies of happy hour) try going for a cooler instead. They’re cheaper to buy and run and are lighter to carry. 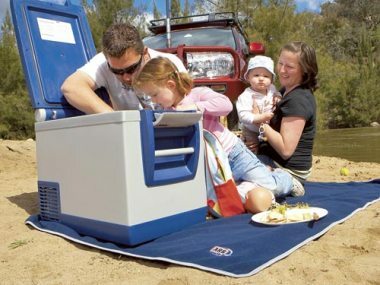 Coleman Australia claims its 47L Wheeled Cooler (rrp $229) will last up to six days on the road: now that’s serious happy hour dedication. 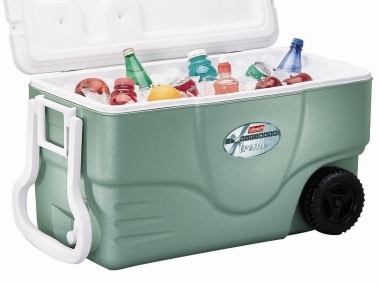 Alternatively, fridges that use eutonic pods (like ARB's 40L fridge at $1199) are a great, if you drive a lot. The fridge uses the car's battery only as you drive to cool the pods, which remain cold once the car has stopped. Long hours on the road can play havoc on your back, so a quality chair to rest your laurels is vital for maintaining happy hour endurance. Outdoor chairs for your RV should be weatherproof, light, strong, ergonomic and compact to fold-away. Coast to Coast RV has introduced the Faulkner brand of RVs chairs to Australia, these adjustable chairs have sturdy powder coated steel frames, UV fabric inserts with padded headrests, and retail for $137.50. Coleman Australia’s striking black and pink Foxy Lady recliner with cup holder, retails for $199, and will appeal to the most fashion-conscience RVer. Many RV manufacturers, particularly those who make offroad vans, pride (no define) themselves on the size and quantity of their external storage. A slide-out barbecue – like the Swift 3 way (rrp $750) – is an excellent way to put those extra bins to use. As long as you keep it clean (it’s not a wok folks) a barbecue slide-out is great for igniting happy hours on the fly. These are all the more useful if a second external bin full of essential barbecuing items is placed nearby. Again, cleanliness is next to godliness here. And our finally, music. Mp3 players are great for remote locations, away from continuous power supplies. If you limit the screen usage, they don’t use a lot of power, are easy to charge as you drive and can plug into external speakers. Portable radios (remember those) work fine in reasonably populated areas, as long as you remember to jot down the details of your local station as you enter the nearest town. Of course, you can get fancy, and have external speakers installed in your RV. Coastline Trading recommends the Axis marine car audio speakers as they are made from weatherproof materials. In this great nation of ours, nothing bonds a group like a sporting event and a good quality external TV bracket, also available through Coastline Trading, will help elevate popularity within the park, provided you have the reception, that is. The best thing is, it keeps all of these new fun loving friends of yours exactly where you want them to be: on the outside of your RV. The final secret that all RV aficionadas know is that sometimes the simplest things are what complete the happy hour experience. Items such as a pack of cards and crossword puzzles are great for keeping on – long after the conversation has ended. And don’t forget, of course, there’s always your favourite magazine.